Good Morning all, it’s Liza, the Owner of The Wandering Path. The earthquake & damage in Nepal does affect me. I chose Nepali hand-crafted items as my first cultural exposure focus for the store because of the people & their generosity; their creative spirits & how very different they are in terms of what is valued & what is not compared to others I had at that time in my own life. What they create & the ease at which they did them was enthralling…beauty is in everything if you take the time to see it. Laughter came easy as did a smile, so for the next week at least if not more, anything my store sells, a percentage will go to support the rebuilding effort. I can only hope that those I know there made it through, if not, I wish them a safe journey. 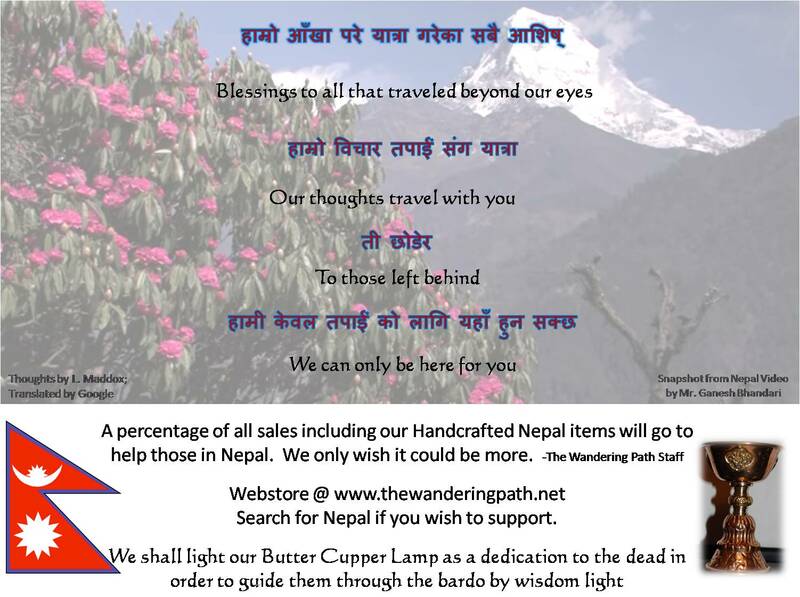 There is always death & tragedies ….so support is always needed, but since I have the Nepali hand crafted items around me…I need to pay homage to them at this time. It’s a stormy Sunday here in Florida. Thunder and Lightning for at least the last six hours and up here in the Panhandle..that is unusual. We’ve only lost power a few times, so that is good and we will keep this short. Last night, the Owner and a former co-worker talked for a few hours. He’s in a new job in a new city and feeling the frustration and also the lack of that “Workplace Hero” or as she calls those unique people that help you get through work frustrations “work hubbies”. It was nice to be appreciated like that and he was her ‘vent’ friend too so it was nice to play catch-up and try to help as much as she could in offering advice on the new position and encouragement that he can do it. So, think about those co-workers you’ve had. Your: Thank the Gods you are here! My “go to” guru for all things that seem hard , frustrating, crazy, you keep me from storming out the door or something worse. I say to you I miss you when you’re on vacation and sick and I pray everyone stays far away from me on those days as I don’t have you to turn to. My workplace hero, hubbie, wifey, guru. That unique type of friend as you keep me sane and help me find joy and laughter at work every day. Send those individuals some good thoughts today and enjoy your Sunday!